Qin Shihuang holds a central place in Chinese history for being the first emperor who united the country. 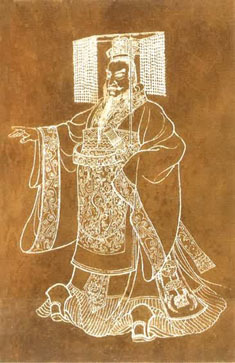 He is also well known for his part in the construction of the spectacular Great Wall and his splendid terracotta army. To ensure his rule in the afterlife, this emperor commanded more than 700,000 conscripts from all parts of the country to build him a grand mausoleum as luxurious as any of the palaces he had in mortal life. Legend says that numerous treasures were placed in the tomb. As time passed, no one knew exactly what was put in the grand palace. Recently, Guo Zhikun, a specialist in the history of the Qin (221 BC-206 BC) and Han (206 BC-220 AD) dynasties, gave a press conference in Xi'an, the capital city of west China's Shaanxi Province. He disclosed his academic research results focusing on the Mausoleum of Emperor Qin Shihuang, making bold guesses about the mysterious tomb complex that fascinates the whole world. Guess 1: How tall was the tomb mound? According to Guo, the mausoleum of Emperor Qin Shihuang is actually composed of two parts: the tomb mound, a hillock above the tomb, and the underground palace, the chamber containing the emperor's coffin. 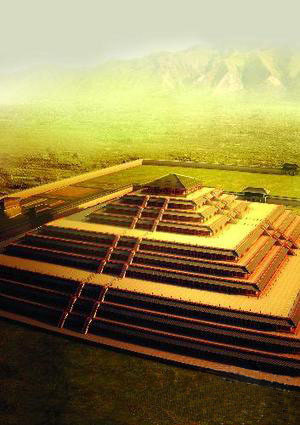 Most historical records indicate that the original tomb mound was 115 meters in height and 2,076 meters in girth. Exposed to the wind and sun for thousands of years, the mound has been greatly weathered down. 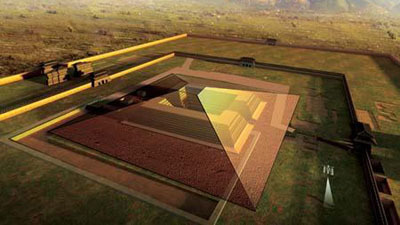 The current girth is 1,390 meters, and the base of the mound covers an area of 120,750 square meters. There has been a decades-long argument about why the mound's height dropped so sharply in recent years. Guo said that most people attributed it to the erosion from wind and rain and to manmade changes. However, another opinion has emerged recently. According to Duan Qingbo who leads the archaeological team at the mausoleum, the height of 115 meters recorded in most historical documents was just a figure copied down from the original blueprint. It is believed that the construction was left unfinished due to a nationwide uprising of peasants. After the emperor's corpse was placed in the chamber, the tomb mound project began. Later, about half of the laborers were transferred to the construction site of another palace building. When the peasant army approached the Mausoleum of Emperor Qin Shihuang, the second emperor of the dynasty, who had taken the throne from his dead father, hastily organized the remaining workers on the construction site to fight against the rebels. No more soil were added onto the hillock later. Guess 2: How many gates does the underground palace have? Opinions also differ on how many gates the underground palace contains. Some said there were two, one made of stone and the other of bronze. Others said that there were six, because Emperor Qin Shihuang had always considered the number "six" auspicious. How many gates does the underground palace have then? After reading through piles of ancient documents, Guo Zhikun said that the exact number was recorded clearly in Records of the Historian, a great historical book written by Sima Qian. In it, the author wrote, "When the emperor died, he was placed in the underground palace. Then, the middle gate was closed and the outer gate was shut down. All workmen were entombed. No one escaped." Guo explained that the emperor's coffin and all his burial articles were placed inside the middle gate. When the palace was shut down, workmen were busy working in it. Within seconds, however, they were entombed along with the emperor and became burial sacrifices themselves. From Sima Qian's description, Guo inferred that the underground palace had three gates: an outer gate, a middle gate and an unmentioned inner gate. In addition, in Sima Qian's record, the middle gate was "closed", which meant it had two planks, and the outer gate was "shut down", which meant it slide down vertically. Guo believed the middle door was locked automatically once it was closed. It was designed deliberately to prevent any breakthrough from inside or any invasion from outside. Besides, Guo guessed the unmentioned inner gate had the same mechanism as the middle one and the three gates were located on a straight line. Guess 3: How many treasures lie buried? The tomb of Emperor Qin Shihuang was filled with fine vessels, precious stones and other rarities according to Sima Qian's record. Liu Xiang, another famous scholar before Sima Qian, wrote in one of his passages, "Since antiquity, no one has ever been buried in such a luxurious manner as Emperor Qin Shihuang." All the sketchy but intriguing words made us curious about the mysterious wealth buried in the magnificent underground palace. In Records of the Historian, one can find descriptions about a golden wild goose, pearls and jade. But what else lies down there? In the late 1980s, a large bronze chariot equipped with life-size horses was unearthed outside the west wall of the underground palace of Emperor Qin Shihuang. These elaborately decorated burial articles fascinated the world about the treasures hidden in the emperor's tomb chamber. "Emperor Qin Shihuang was fond of music. He must have all kinds of musical instruments buried with him," guessed Guo. Recently, a pit for sacrifices was found between the inner wall and outer wall of the tomb complex. Covering 600 square meters, the pit was 40 meters wide from east to west and 15 meters long from north to south. Most of the articles excavated were pottery figures of courtiers, musicians and acrobats. In recent years, a variety of traditional Chinese musical instruments, such as Bianzhong (bronze chimes), were unearthed. 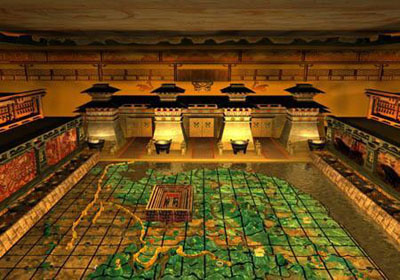 Guo felt confident that the underground palace must have a whole collection of musical instruments. Besides, Guo guessed that there might be many valuable ancient books in addition to treasures and jewels. Guess 4: Does the automatic-shooting crossbows function well? Ancient Chinese tended to bury treasures with them. Not surprisingly, tomb robbery was once rampant throughout the country. To prevent outside invasions, Emperor Qin Shihuang ordered a full range of precautions. It is said that besides poisonous mercury, booby traps with automatically ejected arrows were installed in the tomb chamber to deter would-be robbers. Anyone who dared to break in would certainly die a violent death. However, all those alleged lethal weapons have been buried under earth for thousands of years. Would they still function adequately now? Most people believe that the crossbows would still shoot arrows if they are triggered. Guo also agreed so after he carefully studied ancient smelting technology recorded in historical books. 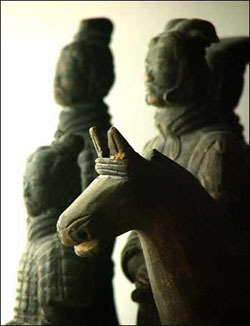 In a modern test, a coating of chromate was found on the surface of weapons excavated along with the terracotta warriors. This coating served to make bronze weapons rust-resistant. Thus, it is highly likely that the automatic crossbows may function well even after thousands of years. Guo speculated that these crossbows were the first automatic burglar-proof devices in the world. "Craftsmen were ordered to fix up these crossbows in such a way so that any thief breaking in would be shot." He quoted a line in Records of the Historian to support his prediction. 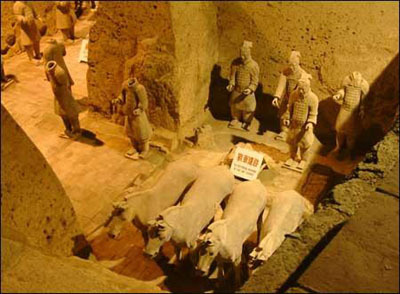 Guess 5: Is the corpse of Emperor Qin Shihuang well preserved? Although it is widely believed that the underground palace has not been disturbed in past years, some people hold the opinion that the emperor's body had putrefied. According to historical records, the emperor died during an inspection tour. It was summer so the body couldn't be kept for long. In fact, records state that the body had started to stink even before it was carried back to the capital. In one of his works, Guo pointed out that it is possible the emperor's corpse might be relatively well preserved. He had three reasons supporting his assumption. First, during the Qin era, it was common practice among aristocrats to put mercury in their tombs to prevent corpses from decaying. Second, when the emperor died, all prominent officials were accompanying him, along with an imperial doctor with superb medical skills who was summoned to his deathbed. Third, modern tests on the soil of the tomb mound show unusually high concentrations of mercury. Guo pointed out all these conditions indicate the possibility of preservation for his body. Guo: All the guesses have to be testified by archeological finds. At the press conference, Guo's new book, Guesses on the Underground Palace of Qin Mausoleum, was introduced to the public. "When I wrote this book, I consulted scores of famous archeologists via letters, E-mails or face-to-face communications. They all gave me tremendous help." Guo Zhikun said that his assumptions were based on the results of previous research. If they turn out to be correct, the credit should be given to all scholars engaged in this field. As technology advances, maybe one day we can open the grand palace and discover all the answers to these questions.